Description: Cap 3 to 15 cm; oval to rounded cylindrical when young, in age becoming bell-shaped and turning to black “ink”, dry, whitish with a brownish center and large, recurved shaggy scales. Gills crowded, totally free from stem, white turning pink then black. Stem 8 to 20 cm long, 1 to 3 cm thick, white, smooth, hollow, equal to bulbous at base. Flesh thin, moderately fragile. Smell and taste mild. Spore print black. Habitat: Clusters, lines or rings in lawns, path or road edges; disturbed soil. Primary Keys: White oval/cylindrical cap with off-white to brown scales; crowded white to pink to black gills free from stem; older specimens turning to black goo. Edibility: Choice: an excellent edible when cooked immediately. Notes: This mushroom is common, easy to identify, delicious, and impossible to bring to market or preserve well. 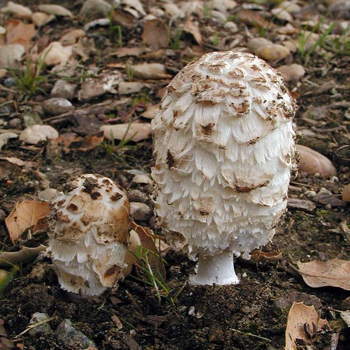 For eating, the mushrooms should be white, have white to pink gills, have absolutely no deliquescing black bits and be eaten within hours of harvest. They also should not be harvested anywhere there is a chance of chemical or environmental contamination. Clean them by rubbing or scrapping, never with water. Combine flour, salt, cumin, oregano, onion powder, egg and milk together in a bowl. Put bread crumbs in another bowl. Remove the stem from the Shaggy Manes and clean the cap. Insert a cheese stick into each mushroom without spreading the cap open. Dip each mushroom in batter, then roll in the bread crumbs, pressing to coat. Fry mushrooms without crowding in 370 F oil until browned, 2 to 3 minutes. Drain on paper towels and serve when cooled a bit.